Well, that made for an interesting late morning. In case you somehow missed it, a line of strong to Severe thunderstorms rolled through the Tri-State triggering both Tornado Warning and Severe Thunderstorm Warnings across our northern counties and dealing damage to at least one Tri-State town. Oakland City, Indiana appears to have caught the brunt of today’s line of storms. 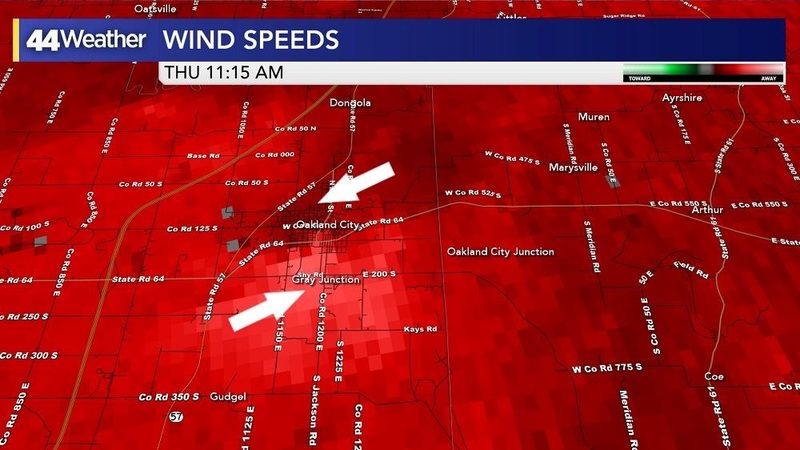 Powerful winds and radar indicated rotation rolled through the Gibson County community damaging structures, downing power lines and toppling trees. 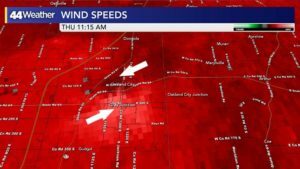 Shortly after the the area of rotation passed though, the National Weather Service issued a Tornado Warning for Gibson and Pike Counties. 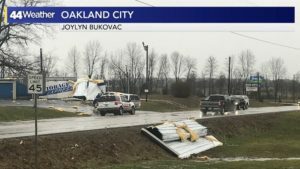 National Weather Service Paducah is sending a survey team to that area tomorrow morning to determine whether a tornado or straight-line winds were responsible for the damage. Despite the Severe Weather earlier today, the story moving forward isn’t inclement weather, but the significant cool down already underway! 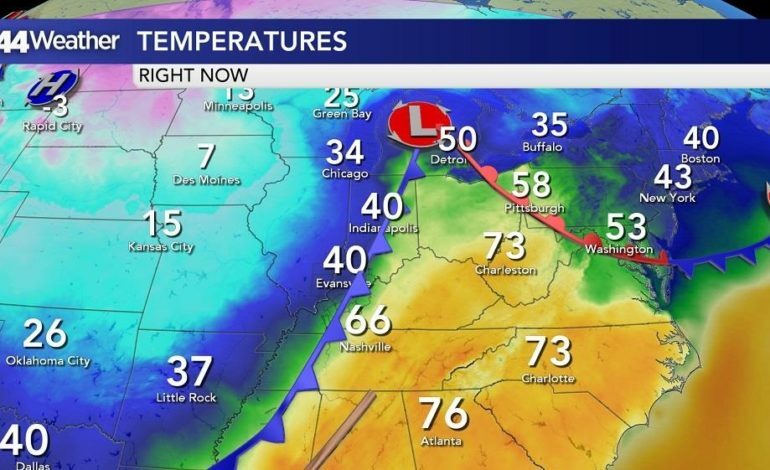 After reaching a high temperature of 67° in Evansville, we’re expected to reach the freezing mark by 7:30 P.M. and overnight lows are headed for mid to upper teens across the region! 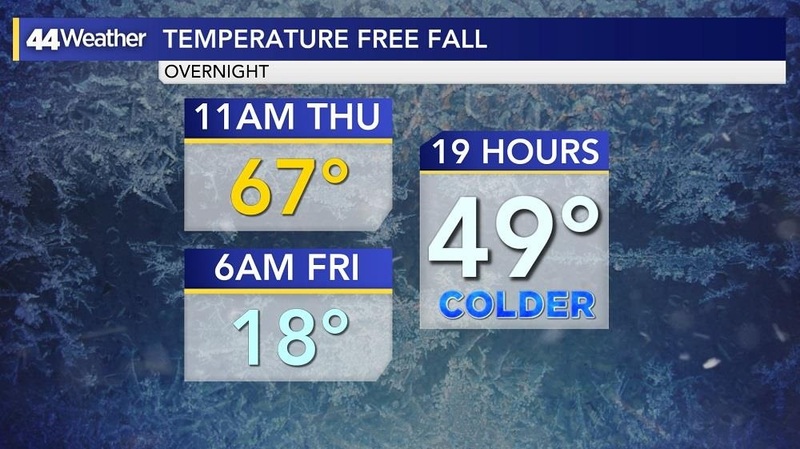 Tomorrow morning’s anticipated low in Evansville is 18° – if that forecast holds, we’ll see at 49° difference in temperature here in the River City in less than 19 hours! Talk about a blast of winter. Fortunately, we’re not expected to receive and snowfall out of the situation, though we could still see a slick morning commute due to the rapid drop in temperature. 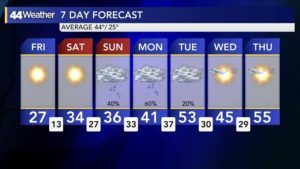 Some portions of the region have seen near 4″ of rainfall since yesterday morning; there’s only so much saturation the soil can take before the water just settles on the surface – tonight’s deep freeze will leave much of that standing water as black ice on roadways, parking lots and sidewalks. 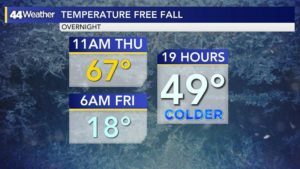 Please use extra caution as you head out the door tomorrow morning. 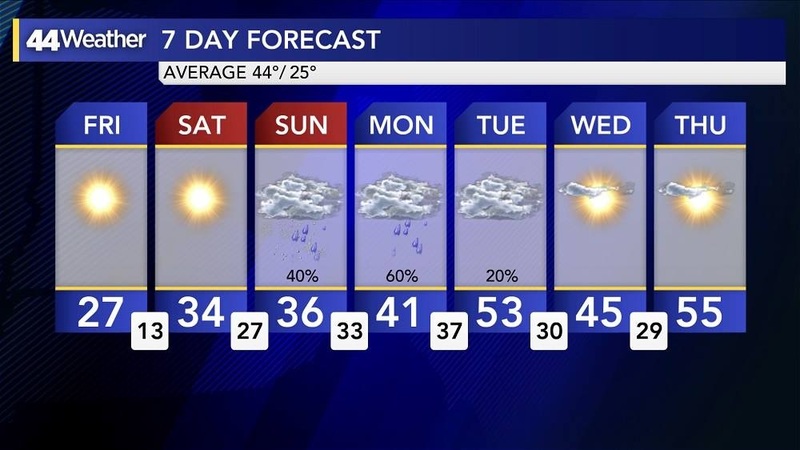 It does appear however, that temperatures will gradually climb back into the 40s and 50s by the early next week.